“Genesis – Together and Apart” New BBC Documentary Coming Soon. A feature length documentary on one of the most successful bands in rock history. From its first beginnings as a band of songwriters in the late 1960s to its final incarnation as a rock giant in the 1990s – via full-blown theatrical progressive rock in the mid-1970s and the subtler jazzy pop of the early 1980s – Genesis could perplex and enrage the die-hards, whilst exciting and exhilarating the newer disciples. 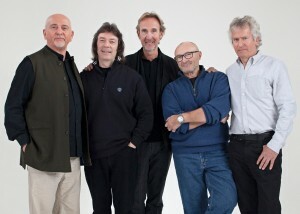 Made with the full co-operation of Genesis, the film reunites all original members of the band together – Tony Banks, Phil Collins, Peter Gabriel, Steve Hackett, Mike Rutherford – for the first time since 1975. The film recounts an extraordinary musical story, exploring the band’s songwriting as well as emotional highs and lows, alongside previously unseen archive material and rare performance footage across their entire career. Transmission date to be confirmed.